Sierra Nevada / Ballast Point Beer Camp Electric Ray - AoM: Beer et al. Unfortunately this beer smells like all the sugars have undergone whatever process they undergo over two years time and the taste reflects that. *Red and lite lagers (e.g., Bud Light) are around 10 IBU, Belgian tripels are around 30 IBU, and IPAs are generally 40 to 70 IBU. 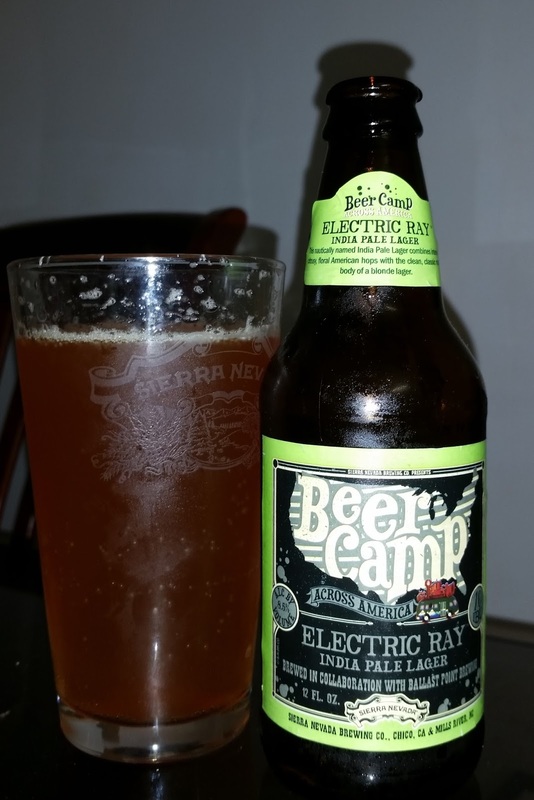 As ever, San Diego’s Ballast Point looked to the sea for the inspiration behind Electric Ray. A play on the fish’s scientific name—Torpedo californica—this beer pays homage to our mutual home state, as well as to our Hop Torpedo, the source of much of the big flavor in this high voltage, hopforward Imperial Pale Lager. Ballast Point brought their homebrewing dreams to the big leagues and started brewing professionally, but they never forgot their roots. They still run a successful homebrewing supply shop in San Diego. A love for hops and the ocean inspire incredible brewed and distilled offerings, and their oneofakind labels boast some beautiful, and sometimes gnarlylookin’, fish. Imperial Pale Lager— combining intense citrusy and floral American hop aroma with the clean, crisp, classic malt body of a robust blonde lager. It is both traditionally dryhopped AND torpedoed with wholecone American hops for an intense grapefruit and roselike nose.